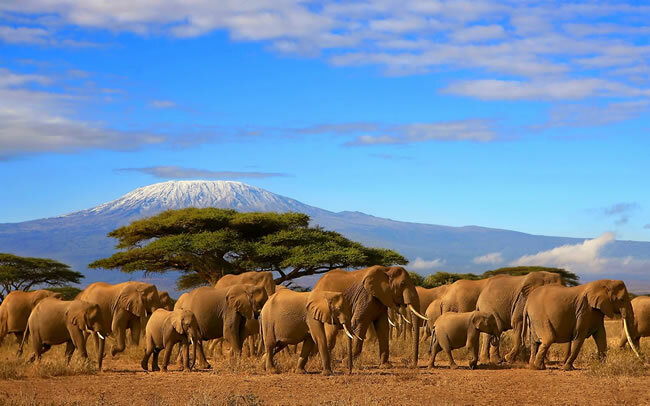 Top 10 Safari Tours | . Sometimes it helps to have someone do the hard work for you. We’ve made a careful selection of the best African safari tours, rated most popular by both our Africa Safari Experts and many independent respondents, and have finalised our Top 10 Safari Tours. Located within the African Great Lakes region in East Africa, Tanzania, officially known as the United Republic of Tanzania, is bordered by Kenya, Uganda, Rwanda, Burundi, Zambia, Malawi, Mozambique, and the Democratic Republic of the Congo. Tanazania is famous for offering an opportunity to have an unforgettable safari experience in all of Africa. Two of South Africa’s landmark destinations feature on this classic 9-day combination tour and the accommodation ranks among the best on the continent. Expect fine wine, gourmet food, huge views and all the thrills of a Big 5 safari in an exclusive Kruger reserve. From Cape Town to Kruger, your journey encompasses South Africa’s astonishing natural beauty. Four incredible southern Africa destinations await the adventure traveller on this 14-day experiential safari: the Okavango Delta in northern Botswana, and Victoria Falls, Hwange National Park and the unique Matobos in Zimbabwe. With a private guide on safari with you for the duration of the trip, you’ll enjoy well-rounded expertise and a completely tailored experience. 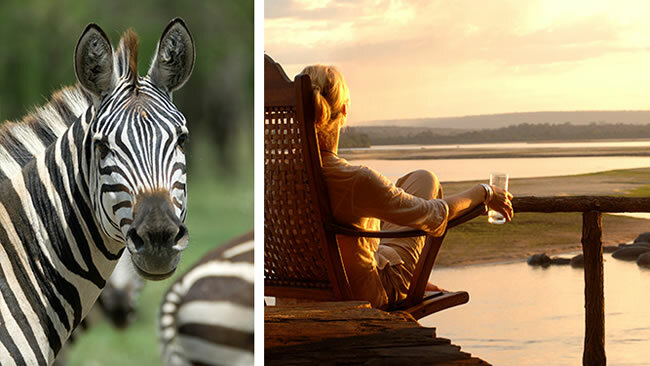 It’s one of our best southern Africa safari tours – ask us about the best time to travel for maximum reward. 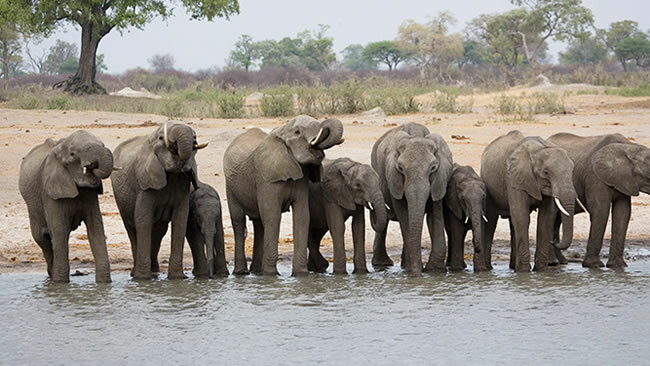 Elephants are a favourite animal to spot in Hwange National Park, particularly when they gather in large family herds at waterholes. From the iconic Masai Mara and Serengeti, travel to Tanzania’s remote wilderness, the Selous, for a completely authentic experience. 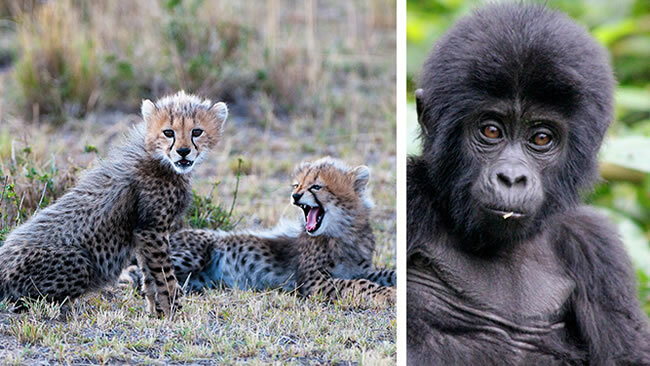 Perfect for the traveller looking for an authentic safari experience, this 14-day Kenya safari and gorilla adventure focuses on special cultural encounters, exceptional game-viewing and breathtaking scenery. Highlights include a balloon safari over the Masai Mara and gorilla trekking in Bwindi Impenetrable Forest National Park in Uganda. Unique wildlife experiences – whether you’re in Kenya’s Masai Mara or Uganda’s Bwindi Forest – are the benchmark for this exceptional East Africa safari. Dividing your time equally between the stark, otherworldy beauty of Namibia and world-class game viewing in private Botswana reserves, this 2-week fly-in safari adventure is one of the best and most luxurious ways to experience the highlights of Southern Africa. 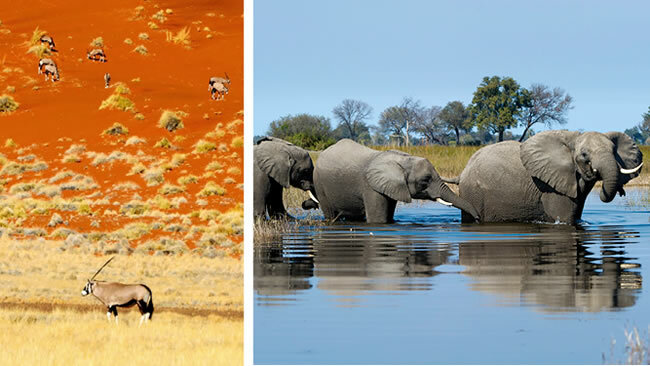 Namibia & Botswana couldn’t be more opposite but both desert & delta offer exemplary wildlife experiences. 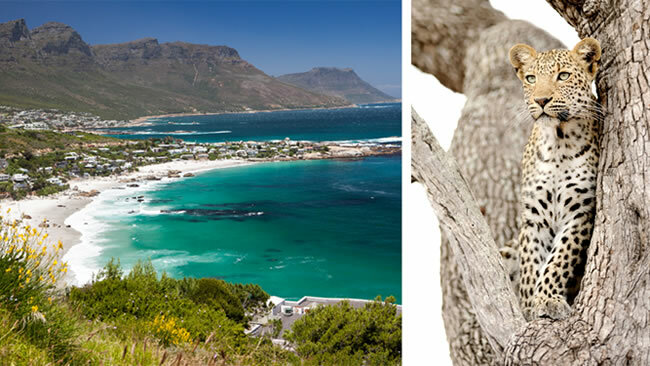 Start your 2-week vacation in Cape Town, Africa’s favourite city. Then search for the Big 5 in a private Kruger reserve before swopping the binoculars for a mask and flippers as you explore the teeming reefs of the Bazaruto Archipelago. Featuring excellent spa facilities throughout, this safari & beach itinerary is perfect as a honeymoon or spoil-me-rotten holiday. 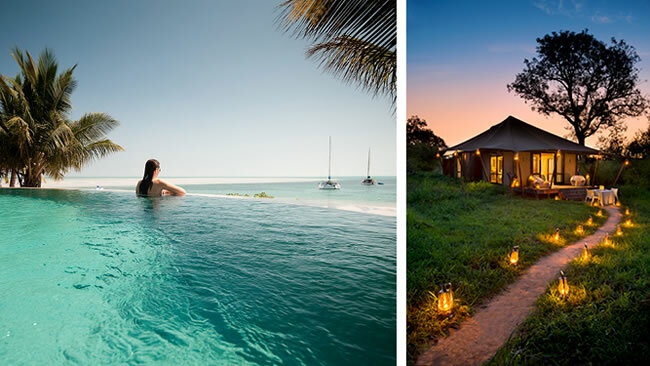 Divide your time between the beaches of Bazaruto & the Big 5 of Kruger for a once-in-a-lifetime holiday. 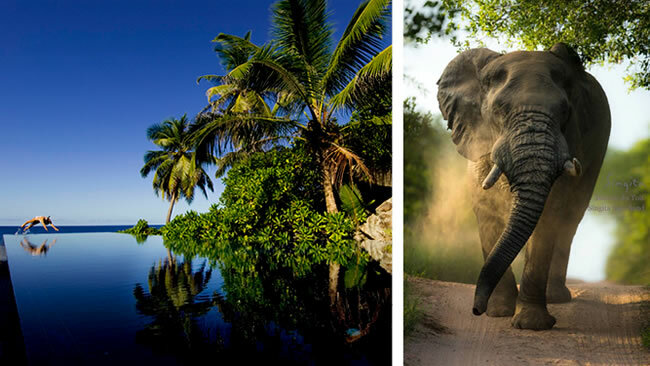 A genuine once-in-a-lifetime experience: ride the world’s most luxurious train on a 3-week journey that packs in a Big 5 safari, iconic sight-seeing and a tropical beach getaway as you sweep across the continent from Cape Town to Dar es Salaam. 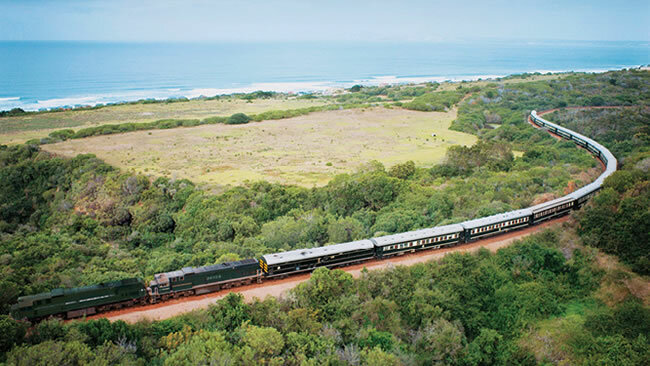 Aptly named the Pride of Africa, Rovos Rail’s leisurely pace takes you through glorious African landscapes. One of our best African tours, this 9-day safari kicks off in Kenya’s Masai Mara before heading south into Tanzania for the Serengeti, Lake Manyara and the Ngorongoro Crater. Focused on wildlife, this is a great opportunity to witness the wildebeest migration so ask us about getting your timing right. 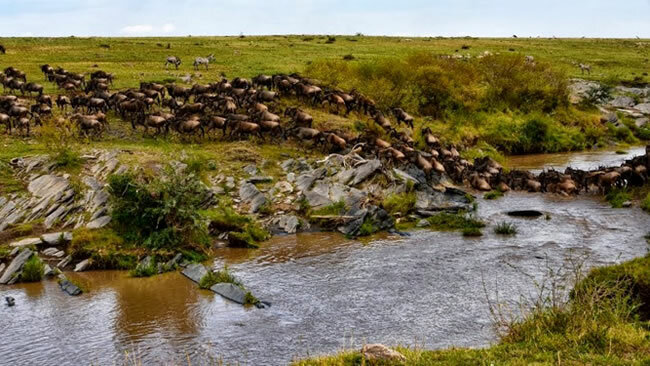 River crossings are one of the most exciting aspects of the Great Migration across the Serengeti & Masai Mara. Sensational accommodation in three of Africa’s most sought-after destinations is the order of the day with this diverse and highly rewarding 15-day tour. Perfect for a honeymoon or exclusive celebration, this tour blends the Big 5 with dreamy scenery and luxurious barefoot beach living.